Williamson County Crime Stoppers will pay up to $1000 for information called into 615-794-4000 that leads to an arrest and indictment. Callers will remain anonymous, they will only be known by the code number they are issued. The Williamson County Crime Stoppers program is a 501(c)(3) non-profit organization that works in partnership with the community, the media and law enforcement to prevent and solve crime and create a safer community. All contributions to WC Crime Stoppers are tax deductible. Your donations are critical to helping WC Crime Stoppers help law enforcement stop crime! Conviction rate on cases solved by a tip to the program. Williamson County Crime Stoppers is made up of a board of civilian volunteers co-ordinated through local law enforcement. It serves all the communities in Williamson County including. Franklin, Brentwood, Fairview, Nolensville, College Grove, Triune, Arrington, Thompson Station and Spring Hill. Crime Stoppers is a very cost effective way law enforcement can gather information on crime. One phone call has the potential of solving many crimes in any given area. The program is a “law enforce­ment multiplier” allowing more time for law enforcement to solve other crimes. Since the first case, more than 1,000 commu­nity and scholastic programs have started. Today, Crime Stoppers reaches around the world and is represented in the United States, Canada, Caribbean, Latin America, Europe, Australia and the South/Western Pacific regions. Crime Stoppers is a partnership between the Community, the Media and Law Enforcement. Citizens are responsible for forming a Crime Stoppers non-profit corpora­tion. The Board of Directors set policy, establish police contacts, determine the amount and method for reward payments, coordinate activities with law enforcement and the media and generally oversee the program. Crime Stoppers is publicized on a regular basis by all media outlets including print, broadcast and web-based partners. Special attention is given to unsolved crime re-enactments, “Crimes of the Week”, cold cases, narcotics activity, wanted fugitives and suspected terrorist and gang activity. Local law enforcement agencies receive and process the anonymous tips received through Crime Stoppers and solve the crimes. If the information leads to an arrest the caller will be paid up to $1,000 for their information. Crime Stopper programs are started by concerned citizens who want to help their communities fight the war on crime. Each program is independent and operates under its own bylaws and Board of Directors. 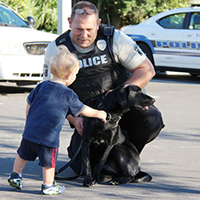 Board members come from all segments of the commu­nity and donate their time and talents for one common goal — to make the program a success by assisting law enforcement in reducing crime. Crime Stoppers was the brainchild of a young Albuquerque detective who was concerned by the number of unsolved cases he and fellow detectives were working, and was particularly frustrated that he had exhausted all possible leads on the murder of a young college student. He felt informa­tion that would solve the crime was avail­able from someone other than the criminal. That principle led to the major factors that needed to be addressed so individuals would come forward. FEAR: Some people feared the court system. Others were frightened of the retaliation from the criminals they would be giving information against. Offering anonymity to people who provided information about crimes was the key to solving this problem. APATHY: Some did not want to get caught up in the judicial system; others did not want to testify in court. There was a reluctance to get involved. This detective recognized that many people he was trying to get informa­tion from were not going to provide the facts unless there was something in it for them. The answer was paying a Reward for information that led to an arrest. Accepting the fact that a tight budget would not allow much money to establish a reward fund, the detective set out to ask local business leaders to raise the funds. The next hurdle to cross was publicity. Help was enlisted from the local media to publicize the first “Crime of the Week” and the phone number to call with infor­mation. With a lot of hard work, the first Crime Stoppers program was born on September 8, 1976. The first call received by the program resulted in the arrest of three men, within 72 hours, who had been involved in the homicide of a student that had occurred four months earlier. 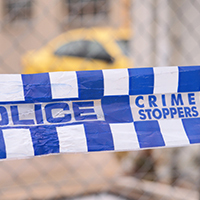 Crimestoppers is a citizen, media and police co-operative program designed to involve the public in the fight against crime. 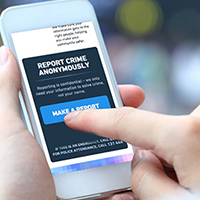 Crimestoppers provides citizens with a vehicle to anonymously supply the police with information about a crime or potential crime of which they have knowledge. Cash rewards are offered to people who call the program and their information leads to an arrest. If I call Crime Stoppers will I be involved in the case? No. Your identity will be kept completely anonymous. Will I be asked to testify? Will I be implicated in the crime? How will I be identified when I call Crime Stoppers? Each caller is assigned a number when they call in, and you use the same number if you choose to call back. What do I have to do to receive my reward? If the case leads to an arrest and indictment, call in and give your number and decide on a meeting place. Why would I want to report a crime to Crime Stoppers? Crime Stoppers of Williamson County is working with your help to make your community a safer place to live. If MAILING donations PLEASE send to the PO Box address.